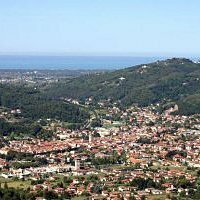 Camaiore a wonderful city that extends from the suggestive Apuane Mountains up until the Tyrrhenian sea, in the heart of Versilia, a magnificent area full of charm and traditions and lively mundane activities. Situated a few kilometres from Viareggio and Pietrasanta, the town of Camaiore is an impressive region that in few other places in the world you can find, in fact, its territory varies from the sea to the hills, from the mountains to the lake, from the beach to the park of the Apuane mountains. Of ancient origin, the city dates back to around 190 BC when the Romans, once founded Lucca, built several fortresses at the foot of Mount Prana, thus was born the Lucensis Cologne, from which comes the name of Camaiore. Among the main places of interest in Camaiore we would like to mention: the Abbey of Camaiore or St.Peter, a church situated immediately outside the city centre and characterized by typical roman architecture with a nave and two aisles St.Stefan’s parish church,a splendid religious roman building built in the XII century, our Lady of Assumption Collegiate, within whichit is possible to admire some magnificent works such as the Annunciation by Stefano Tofanelli; the Olive Theatre, one of the most antique in the province of Lucca the municipal Archeological Museum and the Museum of sacred art.